For most American servicemen and women serving in the military overseas their holiday wish is simple: to be home for Christmas. Soldiers sacrifice much for the sake of others, not the least of which is being able to spend the holidays with their loved ones. The melancholy words of the soldier overseas writing a letter home, echos generations of soldiers who long to be home but are unable to e because of the war. The wistful holiday classic written during WWII was the perfect sentimental war-time song holding deep meaning to US troops overseas and it rings as meaningful today as it did 70 years ago when it was first recorded. Unlike today when service in the military is not shared by most Americans , WWII was a time when most families had at least one empty chair around the Christmas dinner table. In the winter of 1943 the US was a long way from victory despite the Allied victories at Guadalcanal, Tunisia and the surrender of Italy . Wartime Christmas was different from the jolly ones we remembered. Sure there were evergreen trees, and bright red holly, but grim necessity had forced so many things to change, now that rationing and shortages were in full swing. Christmas shopping continued if not with a heavy heart, then a with a strong back since shoppers were encouraged to carry all their packages home no matter how large due to cuts in delivery services. Even Xmas cards were scarce due to the paper shortage. Our traditional holiday standing rib roast would have to wait till after the war since fighting men needed meat more than we did, and Christmas would be less sweet without all the sugary treats since both sugar and butter were rationed too. 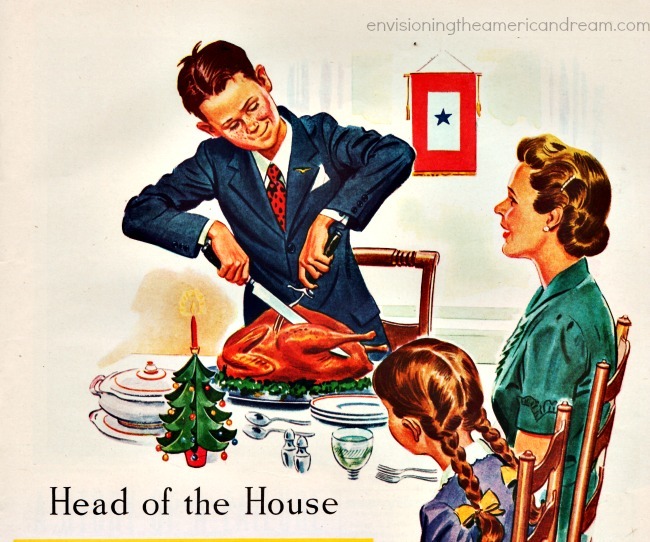 Of course we were better off than most of the boys overseas who would be eating Christmas dinner from a mess kit, so it was unpatriotic to complain. 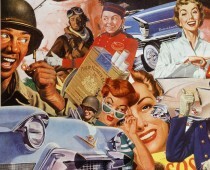 That new pair of roller skates for Jr. would be hard to find since metals were desperately needed for war duty, perfume for Mom was near impossible to get since the alcohol used to produce it was vital to the war, and the holiday Whitman’s box of chocolates for Grandma was hard to come by because so many were going to our fighting men here and abroad. Fondly remembered things would mean more than ever…. 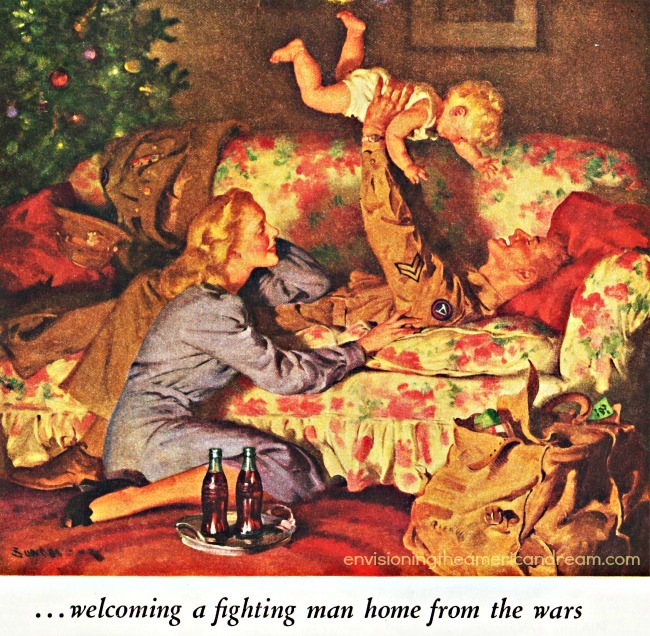 The all too familiar trajectory of the American family’s Christmas in wartime was summed up in one sentimental wartime ad. 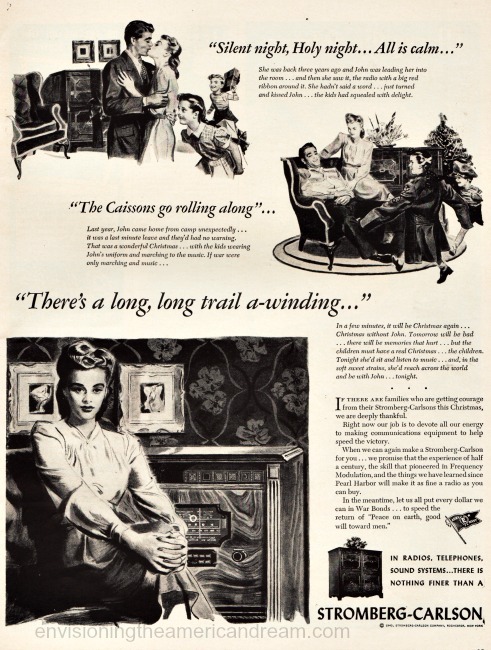 This Stromberg-Carlson radio ad that tugged at the heartstrings, ran during Christmas time 1943 and featured one such war-torn family, that gained strength thanks to the music from their Stromberg Carlson radio. It seemed the only thing that got Lorraine Babbitt through Xmas that year was music. Bing Crosby had really out done himself last Christmas season with his dreamy White Christmas. “How could Der Bingle possibly top himself this year,” she wondered. The baritone crooner didn’t disappoint. 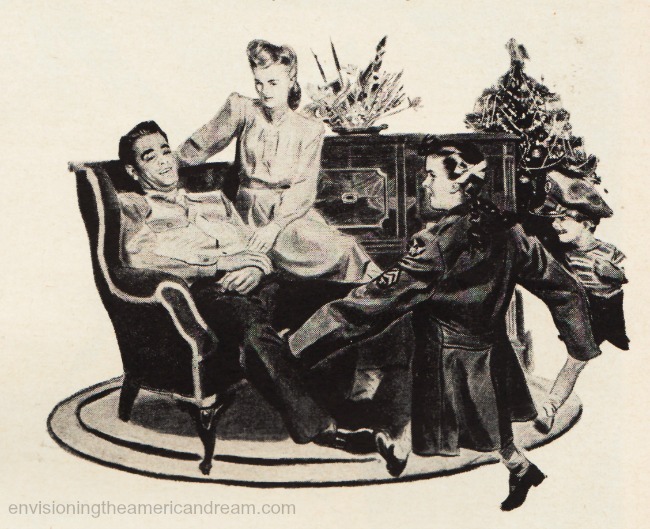 His Christmas time offering for 1943 “I’ll be Home for Christmas” caused lumps to form in everyone’s throats from the home front to the front lines. The heartfelt words of the soldier overseas writing a letter home could have been anyone’s son, brother or husband. It certainly could have been Lorraine’s husband John. 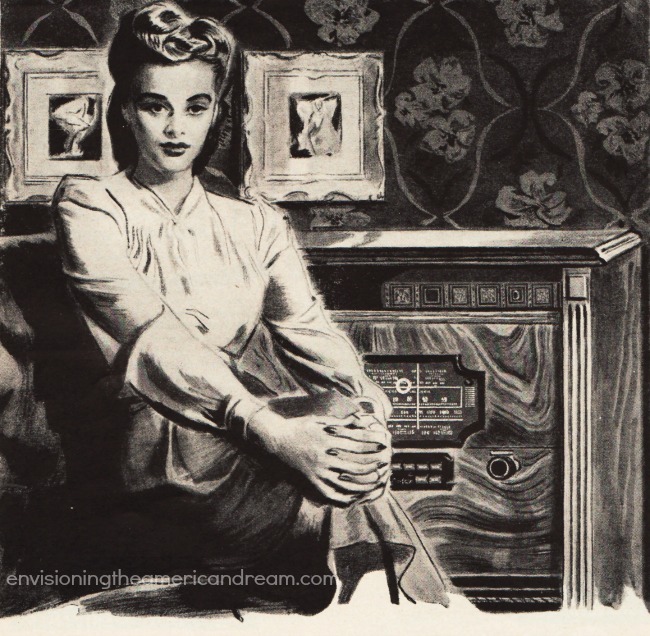 Lorraine would play the 78 record of the melancholy song over and over as if merely wishing John home for Xmas would make it so. Lorraine grew forlorn, her thoughts drifting back to a happier time , Christmas 1940, a full year before Pearl Harbor and our last Christmas of peace for a while. 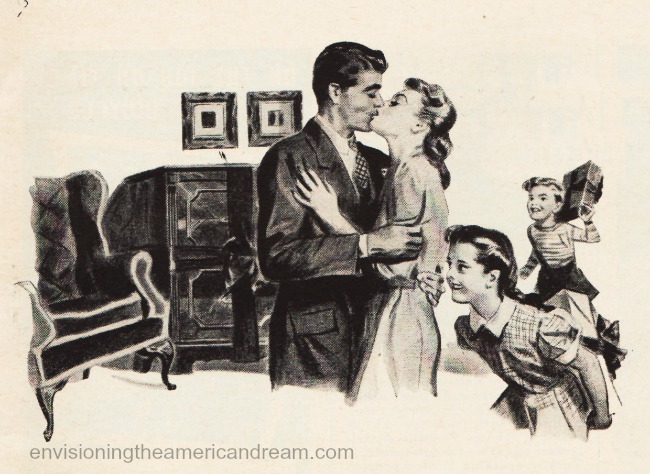 By 1942, her husband John had been drafted but was granted a furlough much to the delight of Lorraine. ”Last year, John came home from camp unexpectedly…it was last-minute leave and they’d had no warning. That was a wonderful Christmas…with the kids wearing Johns uniform and marching to the music. If war were only marching and music…”Lorraine muses to herself wistfully. Now it is Christmas 1943. If only in her dreams…..
Merry Christmas to all and to all who can’t be with their loved ones for the holidays. © Sally Edelstein and Envisioning The American Dream, 2013.